The resolution notes, "President George W. Bush may have committed crimes involving the mistreatment of detainees, the extraordinary rendition of individuals to countries known to engage in torture, illegal surveillance of United States citizens, unlawful leaks of classified information, obstruction of justice, political interference with the conduct of the Justice Department, and other illegal acts," and that, "Bush has been urged to grant preemptive pardons to senior administration officials who might face criminal prosecution for actions taken in the course of their official duties." 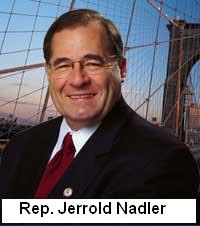 Rep. Nadler is the current chairman of the House Judiciary Committee's Subcommittee on the Constitution, Civil Rights, and Civil Liberties. According to an email sent out by Democrats.com, Nadler's leadership on this issue is crucial because he "can use his credibility and clout to move the resolution forward either during the lame duck session in December or when the next Congress convenes on January 6." Democrats.com has also urged the public to persuade their representatives to co-sponsor H.R. 1531. You can contact your representative on your own, or sign the petition at Democrats.com, which will automatically forward your "yes" vote to your representatives. Jon Gold on Sat, 11/22/2008 - 8:26am. to see Bush pardon himself. It would surprise me less to see Americans not even care about it. WISDOM on Sat, 11/22/2008 - 10:24am. Hitler also passed a bill to exempt the Nazis criminals of their crimes but it did not stop the Nuremburg Military Tribunals doing their job. Bad laws that are made can be undone ! mouv4x8 on Sat, 11/22/2008 - 12:35pm. That's right. Bush can do whatever the heck he wants to pardon himself and his fellow criminals, but that will never insulate him from prosecution by an international court. I hope Bush, Cheney, Meyers, Rove, Rice, Wolfowitz, Rumsfeld, Zelikow, et al.... live to see the day when they are indicted and prosecuted. MrEguy on Sat, 11/22/2008 - 2:40pm. BreezyinVA on Mon, 11/24/2008 - 12:47am. Nadler's noodling says nothing other than "We uns don't think pre-emptive pardons are a good idea. Don't do it. Wink, wink, nudge, nudge. Oh, and enjoy life in Paraguay." They are laughing their asses off as they kill this country and drive it into the Mega Depression. The misfortunate ones left here after their crime bosses escape are going to be the ones to pay for the rest of them. dicktater on Mon, 11/24/2008 - 4:20am.